Sinking a hole-in-one normally means getting in a round of drinks at the clubhouse for the amateur golfer. But professional Jordan Spieth went a step further to mark his achievement at the BMW Championship in Chicago. 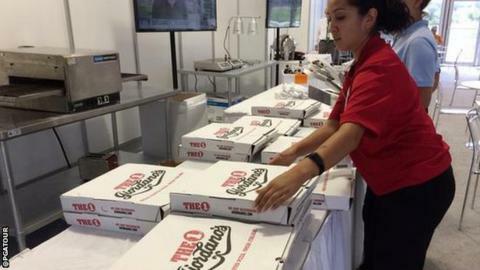 The American, 22, bought 30 pizzas and eight cases of beer for journalists in the media centre and volunteers at the Conway Farms Golf Club. The World number two completed his hole-in-one at the 186-yard second tee on Thursday. The event is being led by Australia's Jason Day. Day tied the PGA Tour record by adding an eight-under 63 to his 61 from round one to lead on 18 under par at the halfway stage. Spieth (66) is seven shots back, while world number one Rory McIlroy (65) is nine adrift on nine under. Spieth decided to follow a recent tradition started by fellow professionals. Earlier this year America's Rickie Fowler sent 300 beers to the media centre after his hole-in-one at the Robert Trent Jones Golf Club in Virginia. And fellow American Brian Harman sent beer and whisky to journalists after hitting two hole-in-ones at Plainfield Country Club in New Jersey.